CQB city is open to the general public on Thursday's, 4PM to 9PM for Pistol only night. 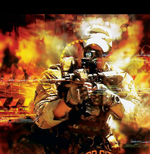 Friday, 6PM to 1130PM for our Night Tactical Event, and Saturday and Sunday 1PM to 7PM for our All Ages Combat Event. If you own your own Airsoft weapon and gear, reservations are not required. Simply come in during registration (Friday 6-7PM and Sat/Sun 1-2PM) and sign up at the door. If you need to rent weapons, please call us a day or two in advance to reserve them, as we tend to be completely rented out by game days. Our safety briefing starts SHARPLY at 5PM on Thursday, 7PM Friday, and 2PM on Sat/Sun., so plan on arriving with plenty of time to register, chrono your weapon, and be ready to go by briefing start time. Anyone who has not chrono'd by briefing time will have to sit out the first scenario so please, DON'T BE LATE!!! Scenarios run about 20-25 minutes each with 10 minute breaks in between and we run 6-8 scenarios a day. Dinner is served from 5-530 PM so make sure to order your dinner when you register or you'll go hungry! CQB City is open to anyone 10 years old and up. Recommended attire is long sleeves, long pants, and loose fitting clothing. Rubber soled shoes are required; no flip flops, sandals, open toed shoes, shower shoes, or bare feet allowed. A waiver must be on file once a year for anyone entering the facility, even if you are just coming in to watch (yes, you can watch the battles from our control tower if you're not ready to jump in yet.) A link to our waiver is available below or on the home page. Parents or legal guardians must sign the waiver for anyone under the age of 18. Click here to fill out our new online waiver!